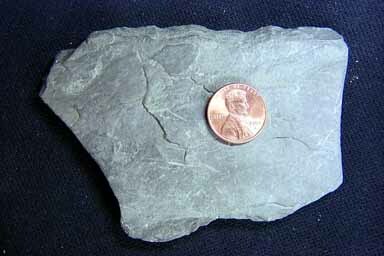 Unlike shale#1 which lacks bedding and is a mudstone, this shale has fine millimeter scale laminations in it. This image is looking down on a bedding plain. The dark color of this specimen respresents the presence of incompletely decayed organic matter (humus) making the rock dark gray . From the shale alone no tectonic interpretations are possible. Shale shows up in many environments in many tectonic situations, but out of context of other rocks with which it was deposited nothing can be confidently said about tectonic associations. Shale = quiet water deposition. Aside from this it is hard to say anything definitive about the environment of a shale since most environments have periods and places of quite water deposition. For example, shales are common in basins, shelves, deltas, meandering rivers, flood plains, etc. Some broad interpretations may be made from a shale's color. Red colors mean well oxygenated environments, such as river channels, some flood plains, and very shallow marine. Green colors mean an environment low in, or lacking, oxygen, often associated with marine environments. Dark gray to black colors mean anoxic conditions, which may mean deep water, but could also be a swamp environment. The conclusion is, environmental interpretations can only be made in relation to the other rocks deposited with the shale. The dark gray of this specimen indicates a low oxygen environment. From its geologic context we know it was a relatively deep water, quiet, marine basin.